Bilateral relations have seen a strong revival in recent months. Israel has been busy of late, strengthening its ties with East Asia, and Japan is no exception. The flurry of diplomatic initiatives by both countries come after a period of prolonged silence. While the magnitude of cooperation with Tokyo is not on a par with that of Israel’s engagements with China and South Korea, emerging developments may well take the bilateral ties to a new level. Israel’s rapidly rising importance to Japan has come at an opportune time for Tel Aviv, with an evident decline in the strength of its ties with the European Union and its major partner, the United States. In the Middle East too, there has been a further widening of Israel’s isolation, particularly after the Gaza crisis last summer. How to explain the warming of relations between Israel and Japan? There are several factors. From Japan’s perspective, stepping up cooperation with Israel has been a priority for Prime Minister Shinzo Abe. Tokyo wants to benefit from Israel’s military industries in enhancing its defense capabilities, particularly against an increasingly defiant North Korea. Another enticing factor is Israel’s continuing stability at a time of turbulence in the Arab world that began with the uprisings in late 2010. For Japan, Israel appears an attractive partner. The more positive sentiment towards Israel in East Asia has meanwhile encouraged Tel Aviv to give more attention to this part of the world, and particularly the world’s third largest economy. In practical terms, efforts to improve bilateral relations have involved reciprocal visits and discussions to bolster cooperation in defense, cyber security, trade, tourism, science and technology, and so on. As yet, these overtures have had only a modest impact on overall economic ties. During 2013, Israeli exports to Japan stood at $0.72 billion, against imports of $1.1 billion. Israeli exports included machinery, electrical equipment, medical equipment, chemical products and polished diamonds, while Japanese shipments were led by automobiles, machinery, electrical equipment and chemical products. In 2014, bilateral trade only touched $1.75 billion, an increase of 9.3 percent. These figures suggest scope for expanding the economic aspect of the relationship, something Israel has been doing with China and South Korea. Israel’s decision in early January 2015 to open a trade office in Osaka and to increase the number of commercial officers in Tokyo is a good first step. A major breakthrough in Israel-Japan relations came with the May 2014 summit between Israeli Prime Minister Benjamin Netanyahu and his Japanese counterpart Shinzo Abe in Tokyo. The meeting opened an important conduit for cooperation. Several bilateral agreements were signed, covering high-level visits, security and defense cooperation, as well as economics, agriculture, space, tourism and culture. In addition to these bilateral issues, both countries have agreed to cooperate in promoting peace and stability in the Asia-Pacific and Middle East. Terrorism was another issue flagged by both countries. It is important to note that since Israel established diplomatic ties with countries such as Indian, South Korea and China, in the early 1990s, defense cooperation has become one of the most important pillars of its diplomacy. Israel has gone on to collaborate with its Asian partners in weapons manufacturing programs. Sino-Israeli military ties did have to be dropped in the mid 2000s after Israel came under extreme pressure from the U.S. for strategic reasons, but Israel continues to benefit from arms exports to India and South Korea. In contrast, the Japan-Israel defense relationship has hitherto been quiescent. As such, the May 2014 breakthrough in this area would have been welcomed in Israel. After a noticeable drop in Israel’s arms exports to countries in Europe and North America, mainly due to defense budget cuts and the withdrawal of the U.S. troops from Iraq and Afghanistan, Israel has begun to look to markets in Asia. Apart from the lucrative Indian, Singaporean and South Korean markets, smaller countries such as Philippines and Vietnam are also rapidly warming to Israel and its sophisticated weapons systems. Asia-Pacific region has emerged as the most important region for Israeli arms sales, and this is evidenced by the export figures of 2012 and 2013. In 2013, Israel saw a decline in its arms exports worldwide, to $6.54 billion from $7.2 billion in 2012. The Asia-Pacific region, however, was the main destination for Israeli arms during 2013, with shipments worth $3.91 billion, compared with $4 billion in 2012. The figure for 2014 is likely to improve following major deals signed with New Delhi, Seoul and Hanoi. Still, it remains uncertain the extent to which both Israel and Japan can advance their ties in the defense arena. For instance, joint development of military weapons is unlikely to begin any time soon. One area of cooperation between Israel and Japan that will definitely be strengthened is cyber security. With cyber security issues taking on growing prominence, both countries see significant potential for cooperation, given their strengths in this area. The Israeli government has approved an investment plan to speed up cooperation in space and cyber-related R&D. According to Defense News, “The plan calls for investing an unspecified “millions” of shekels over three years to foster bilateral trade ties, expand joint research grants and increase cooperation in space, cyber and information security.” Similar cooperation is developing between Israel and India. Meanwhile, in early 2014, Israel Aerospace Industries subsidiary Elta announced plans to open a new R&D center in Singapore for cyber security, the first of its kind in the region. Cooperation in civilian areas such as tourism and cultural exchange will be boosted. Israel has planned to increase the number of Japanese tourists by 45 percent in 2017. Japanese food items such as sushi and its popular culture, particularly anime, are widely popular in Israel. On a similar note, the opening of an Israeli restaurant in Tokyo that will serve kosher food items is an important breakthrough. These are some of the tools used by these two countries to cultivate public relations. While there is a visible bonhomie between Israel and Japan, there are issues that could, to some extent, make the latter tread carefully. Take, for instance, Tokyo’s close ties with the Middle Eastern countries in which most of its oil projects are located. As an energy-dependent country, Japan would rather not irk oil producers that are still at odds with Israel. Japan’s longstanding support for the Palestinian cause is another issue that could influence its relations, particularly defense ties, with Israel. Tokyo even condemned Israel’s military actions during the 2014 Gaza crisis, and its building of housing units in East Jerusalem. 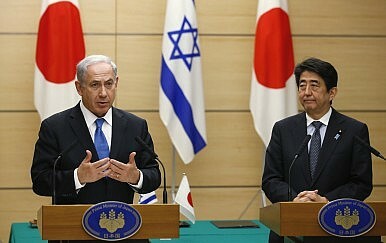 It has yet to be seen how Israel and Japan will navigate their relations in the presence of these potential obstacles. For the moment, though, the two countries seemed determined to nurture their ties. If Israel does manage to consolidate its foothold in Japan, then it can count its Look East policy a success. Alvite Singh Ningthoujam is a PhD researcher at the School of International Studies, Jawaharlal Nehru University, New Delhi, India. By forging closer ties with Israel, Shinzo Abe is trying to make Japan geopolitically more relevant.